Quality: Very good. b/w, 4:3, letterboxed titles, occasional onscreen logo. 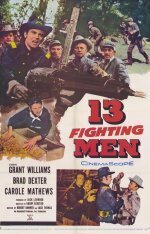 Though the War Between The States has officially ended, a group of Confederate soldiers continues to fight for their own cause, laying siege to a small group of Union soldiers holed up in a farmhouse who are guarding a substantial amount of gold coins for a federal agent.